Volleyball Skills Passing | How to Pass? How to master in serve receive? Explore "volleyball skills passing" -section and learn how to master in volleyball serve receive. What are the most important aspects in passing? The player performs a pass when s/he hits the ball around the torso level - with forearms of the straightened arms. The player moves arms unattached under the approaching ball, stops and takes a well balanced and low passing position. The player places straightened arms together in front of the body, lets the ball hit the platform formed by the forearms. S/he redirects the ball to the setter - by placing the arm platform under the ball and pointing the platform toward the setter - who is the playmaker of the team. 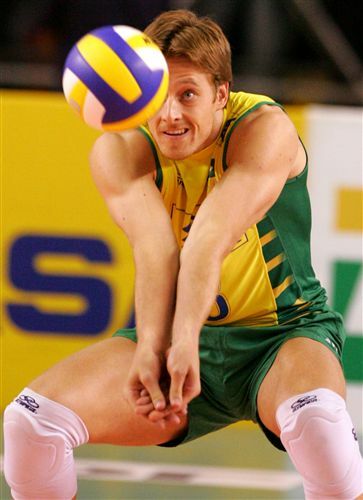 The player may use a very light "directional push" with the arms, legs and body, if an extra power is needed to push the ball to the setter. However, there is absolutely no need to swing the ball with the arms, or push heavily with the legs. 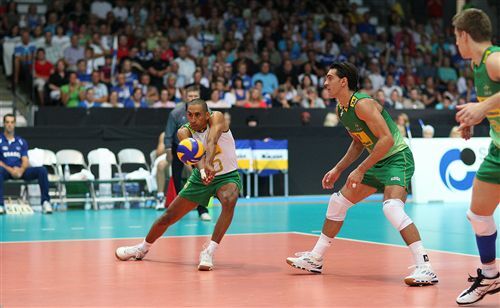 When serve receiving the ball, most often the serve travels so fast that there is no need for "extra push". The purpose of a pass is to direct the approaching ball to the setter who is the playmaker of the team. Passer is the first person to touch the ball when it is travelling over the net. Pass may also be called a bump, or a serve receive or a dig as mentioned earlier. Place the platform under the ball and direct it toward the setter. No swinging with arms. No need to push heavily with legs. Be sure to check shuffling and basic stance information, if you are not familiar with the terms. In volleyball you always have to be ready to move. Don't expect the ball come to you. You need to ve your feet to go under the ball. Always! Many non-volleyball players assume in volleyball you just stand on the court and you really don't have to move. In a long match you actually may end up moving around the length of a couple of miles!! Keep your knees bend. Do not just lean forward with your torso, but drop your hips closer to ground. Your goal is to move (by shuffling) under the ball and pass it in front of your body. It is not possible every time, but your absolute goal is to keep the ball in front of you when passing. Remember to stop your movement before the volleyball hits your forearms. This gives you a better balance. When your both feet are on the ground, it is much easier to pass the ball. Do not swing the ball with your arms!! 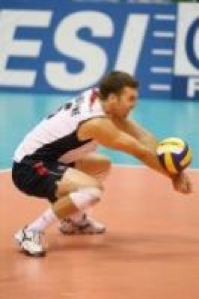 One of the most common mistakes with beginning volleyball players is to swing arms heavily when passing. Swinging makes the pass inaccurate. When the volleyball is served over the net, it approaches so fast you do not need to swing it. It is enough to place you arms under the approaching volleyball and just redirect it to the setter. Most likely you need to reduce the force by cushioning it, absolutely not to swing it.